Liam MacBride is convinced that English ladies are silly sassenachs who think of nothing but social events and clothes. So why is he intensely drawn to Lady Sybil? All they do is quarrel...until loathing turns into undeniable lust. A tempestuous, fiery romance between an English lady and a Scottish laird cannot end well. Her first glimpse of Liam when she and Margaret arrived at the great hall took her breath away. Both men were dressed in traditional Scottish garb; kilts of their clans, with white lawn shirts, doublets, and sporrans. By Liam’s side hung a sword that she could imagine him swinging on a battlefield. 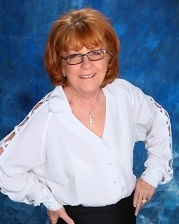 His reddish golden hair was pulled back into a queue and tied with a ribbon. With their broad shoulders and height, the men seemed to take all the air out of the room, despite them being in the great hall. Sybil certainly felt as though there was a shortage of air. Her lungs couldn’t seem to get enough of it. Her heart pounded to the extent she was afraid she would embarrass herself by swooning—something she’d never done in her life. No matter how many times she forced herself to look at the priest, she found her eyes drifting toward Liam. A finer man had never existed. His strong chin, chiseled features, and full lips made small little butterflies in her stomach dance a cotillion. She snapped her head back to face the priest when Liam caught her staring and gave her a broad wink. Honestly, the man had no refinement. I was the one staring at him. Her flustered state kept her from concentrating on the ceremony, and she was therefore, surprised when Duncan turned to Margaret and gave her a chaste kiss before they turned to face the guests. A loud cheer went up from the crowd, foot stomping and whistles reverberating around the room. The bride and groom and she and Liam, as witnesses, signed the marriage book. Duncan led Margaret to the head table. Liam extended his arm to Sybil, and she had a flash of being in his arms a few hours ago. Thinking of how she once again had enjoyed their kiss, heat rose from her middle to swamp her face, surely turning it red. “Are ye all right, lass?” His deep voice, lowered so only she could hear, increased her discomfort. “Yes, I’m fine,” she snapped. He straightened and took his seat next to her. No doubt to a randy Scot that incident was merely a kiss. Most likely something he used with charming regularity to gain access to women’s beds. Well, she would not be one of his women. She was a respectable English miss, who would never dally with a Scot. 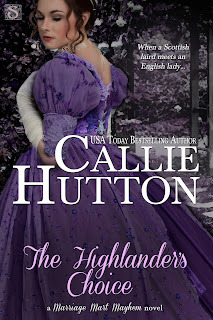 The Highlander's Choice by Callie Hutton is a historical romance, released by Entangled Scandalous on July 14 2015. Thank you so much for hosting THE HIGHLANDER'S CHOICE! I can't wait to read The Highlander's Choice. Following Sybil & Liam should be interesting. Thanks for post.